Deer Removal in Jacksonville, Fl. White-tailed deer are popular animals that people have come to enjoy seeing, photographing or hunting and have reached record population levels. Numbers in many states are at all time highs and are continuing to expand. If the deer population grows beyond it’s habitat quality decreases and the physical condition of the deer herd declines. The white-tailed deer is the most wide-spread and abundant member of the deer family and one of the best recognized large mammals in North America. Damage to landscape may occur at any time of year but is usually most severe in the late winter and early spring when other food supplies are limited. Damage to fruit trees may cause both the immediate loss of the crop and residual tree injury that leads to reduced yields in the future. Deer can also affect their own habitat and the abundance of other wildlife species. Overpopulation can profoundly influence the presence, absence, and abundance of plants and other wildlife. In many forests, over-browsing of tree seedlings creates open, park-like stands that have little or no vegetation near ground level. Instead of a diversity of woody and herbaceous plants, the ground surface may be dominated by ferns, grass, and woody shrub or tree species that are not preferred by deer. 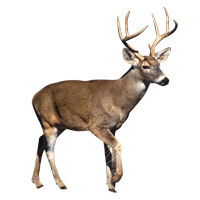 Deer feeding damage is readily distinguished from that caused by rabbits or rodents. Whereas rabbits or rodents leave a clean-cut surface, deer lack upper incisors and leave a ragged, broken end on browsed branches. Another indication is the height of the damage from the ground (up to 6 feet), which often rules out smaller mammals. What are ways to Control a Deer Population? Deer are susceptible to a variety of diseases and parasites however most of the diseases that effect deer do not effect humans on general contact. One should use common sanitary protection to prevent getting illness or infection when touching an animal. Lyme disease can be passed from deer ticks. Call Quick Catch today (904) 859-6585 or Contact Quick Catch to get your deer, buck, doe or fawn problem resolved.